Quality hooks with a smooth satin nickle look! I rate the InterDesign T-Bar Shower Hooks a perfect 5/5. I love the uniform and soft satin nickle look. These are solid metal hooks, not flimsy or hollow like others I've researched. I was looking for a modern look that wouldn't be too shiney, and these work perfectly. Some have commented on the length of the hooks...the hooks are long enough to create a slight gap between the shower curtain and the shower rod. Personally, I really like the look and I've included a picture for those questioning this aspect. Also, they glide smoothly along my shower rod without catching (even on the shower rod seam which is nice). Again, for a quality purchase under $10, I rate these a perfect 5/5. Thank you for reading and rating my comment!! i love the design of the shower hooks and even after all this time in use, it still looks brand new. the reason for my 3 star review is that when you pull the shower curtain to open or close, it unhooks very easily and I'm always busy hooking them up again. maybe if someone has a thicker rod it wouldn't happen , but this is my experience. Took me less than a minute and zero effort to hang my new shower curtain. I hang the first and last hole, and then space the middle ones out so the curtain is not cumbersome and pulls down while I fight with the hook snaps. With these hooks you don't have to count the holes so they match, or spend any energy getting it closed. These slip right in and catches on the rod, done. Opening and closing the curtain works fine, and they look great! These are very sturdy hooks. I honestly didn’t even need new shower hooks, but the reason I bought these was because the matched the drawer handles I installed on the bathroom cabinet so perfectly, I honestly couldn’t resist! But they look great and we’re the perfect finishing touch in the bathroom. They do catch a bit when pulling across the shower curtain rod - but I have a curved rod. It’s not a big deal because they pop back on the rod so easy. Would buy again. Love them! 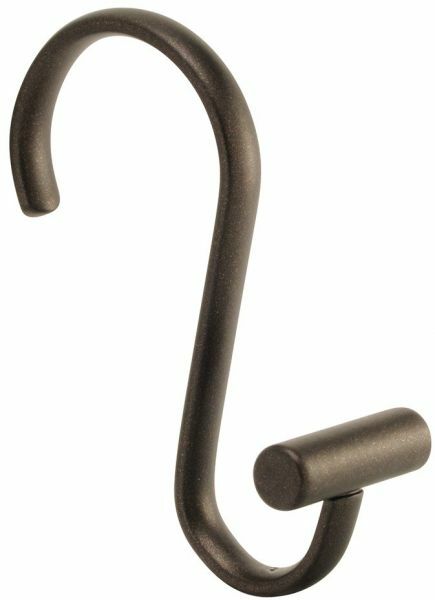 We had these shower hooks before, in rub oiled bronze color and really loved them so when we updated our bathroom to brushed nickel, I had to have the same shower hooks. Unfortunately several of these came and did not fit around the shower pole. Several fit just fine and several had to be "snapped" on because they were bent too far closed. This has resulted in the hooks not sliding a smoothly on the pole as the last set did. I have tried them on both the old pole and the new one making sure it was not the pole.